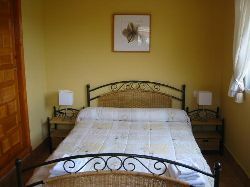 The villa has 2 bedrooms, a sofa bed and two bathrooms. 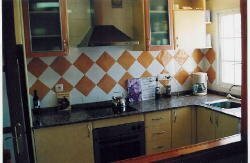 Luxury fitted modern, well equiped kitchen includes: dish washer, fridge/freezer, electric fan oven, washing machine. Lounge/dining room with cable-TV & internet connection. All the rooms are tastefully furnished. 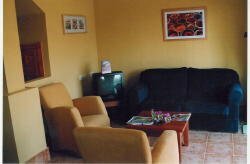 The villa is fully airconditioned (2 units). Swimming pool with large terrace, 4 ea. lounge chairs, BBQ, gardens and parking. Both swimming pool and garden will be maintained weekly. For winter months all rooms can be heated by means of the airconditioning units. 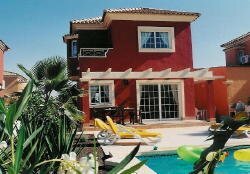 The villa is situated 80 km south of Alicante, 10 km from Murcia and 25 km from the Mar Menor and Mediterranean.